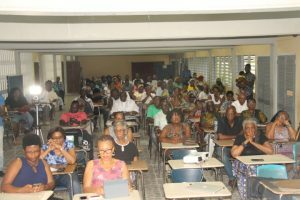 Attendees at the forum organised by The Buxton First of August Movement on the topic “The Coming Oil and Gas Economy: Prospects for Empowering the Poor and Revitalizing the Village Economy”. Internationally renowned Guyanese Economics Professor, Clive Thomas on Sunday recommended that poor Guyanese households receive conditional yearly cash transfers from oil revenues, but an executive member of the Guyana Oil and Gas Association (GOGA) is cautioning that such a formula can be used as a political football. Addressing a forum organised by The Buxton First of August Movement on the topic “The Coming Oil and Gas Economy: Prospects for Empowering the Poor and Revitalizing the Village Economy”, Professor Thomas said he was willing to “gamble” about the importance of delivering cash to ordinary Guyanese. “I believe that some proportion of the net cash flows from oil should be dedicated to giving cash transfers to every single household in this country; whether it be 5,000 US per year or whatever it works out at; we can do the calculation; but there must be a mechanism put in place that every single household and by extension every single person will see the benefits of oil and gas in terms of cheque or cash received into your account,” he said. Thomas, who prefers to hoped that the Working People’s Alliance (WPA) political party of which he is an executive member would adopt his idea. In what he termed a “last ditch effort” to publicly pitch his suggestion of cash transfers while Raphael Trotman was still responsible for the petroleum sector because he was not optimistic that Finance Minister Winston Jordan would support that idea, Thomas said cash transfers from oil revenues could be linked to school attendance, improving health conditions or removing children from work and sending them to school. He said “orthodoxy” by the International Monetary Fund and the World Bank would “demand that he looks upon this as a reckless, insipid scheme even though all the social evidence denies that particular position”. (Left to right). 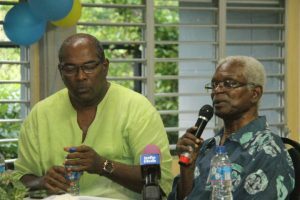 Executive member of the Guyana Oil and Gas Association, Attorney-at-Law, Nigel Hughes and Distinguished Economics Professor, Clive Thomas. Thomas said he was not advocating the handing out of oil proceeds as welfare, but as a means of empowering the poor and powerless because ordinary people were best able to determine how to improve their socioeconomic conditions. “There can be no better spender of resources than a person wants than themselves,” he said. Fearing that the current debate about the agreement with ExxonMobil and local content was not focussing on cash transfers, he contended that such transfers would not amount to a waste of money. He said the Organisation for Economic Cooperation and Development, which is made up of the world’s richest nations, has concluded that such payouts were the single most effective way of combating poverty in contrast to international aid. Acknowledging that there is a risk that such a financing facility for ordinary Guyanese could fail or politicians can steal the money but there was no certainty, Professor Thomas recommended careful planning to avoid those pitfalls. He said in the absence of cash transfers, the middle class that want more contracts would continue to benefit instead of ordinary working people. “The poor and powerless would never be able to change their status without taking political action to direct policy of the state in support of their interest. We are not in a position to leave it to the government or any government, even though it’s a government I might support. I will never leave it to that government to solve the problems of the poor and powerless. You have to take action to make them feel that you want it as a strategic option,” he said. Mindful that ordinary people might waste or spend transferred funds, he was confident that ordinary people would conserve it instead of external agencies such as local or central government. “Poor people know their needs. They would just want a chance and an opportunity to put them to the best uses that can be obtained for themselves and their family,” he said. GOGA Executive Member, Attorney-at-Law, Nigel Hughes warned the more than 100 attendees at the event held at the Friendship Primary School that cash transfers could be used by politicians to manipulate voters. “My fear is that if we start to talk about giving people cash, we are opening the doors to politicians to say ‘I will give you more cash than the next one’ and you end up with a ridiculous election campaign of people being irresponsible about development because it becomes a competition about who can give more,” said Hughes, a former senior official of the Alliance For Change (AFC) political party. Unlike 60 to 70 years different when there were different commitments and views about development, Hughes cited the need for wide education. He suggested that Guyanese engage in a data-driven debate instead of “hot air” to arrive at criteria to assess progress. “I welcome that discussion but I think we need to drag it to data otherwise we are going to be dazzled by the fantastic promises that are going to come from the political pulpit unrelated to reality and economic sustainability and that is a dangerous place,” he said. Reacting, Professor Thomas said the cash transfers could not only be linked to conditions but also set a fixed percentage regardless of whether the oil prices fall “so the limit of your exposure is predetermined so you don’t run the risk of creating a fiscal crisis”. He expressed confidence in ordinary Guyanese to act in their best interests instead of being fooled by politicians making unrealistic promises. “People are not stupid about their welfare, their whole lives and their well-being. You have to be an idiot to believe that somebody will come and tell you that they will give you a million dollars everyday and you must vote for them. Everybody will laugh so I have confidence we can find ways around that problem,” said Thomas, a former Director of the University of Guyana’s Institute for Development Studies. Political Science Professor, David Hinds of The Buxton First of August Movement tasked the community with brainstorming Thomas’ idea of cash transfers. “We are not going to sit down and wait for some cheque to come to us. We are going to discuss that policy- the pros and the cons of it and how can we prepare ourselves. You see, it’s not the money in our hands; it’s what we will do with that money when it gets into our hands and it is our responsibility, as communities, to prepare people for that,” he said. Guyana is planning to establish a sovereign wealth fund to save for the future, provide stabilisation and fund national developmental transformative projects.